Terri Collins, town tax collector. Two times a year, in July and January, many Barkhamsted residents engage in an activity that probably is not at the top of their list of favorite pastimes: they pay their town property tax bill. Anyone holding property in Barkhamsted, including real estate, motor vehicles or some types of personal property should be familiar with this obligation, although the bank may be handling it for you if you have a mortgage. It is part of a process that pays for town services from schools to roads to emergency response. Property taxes are a major component of town revenue, producing $5.6 million in 2000, which is about 75% of all revenue the town takes in. At the center of this process is Tax Collector Terri Collins whose job is to help make the collection of the town taxes as smooth and efficient as possible. 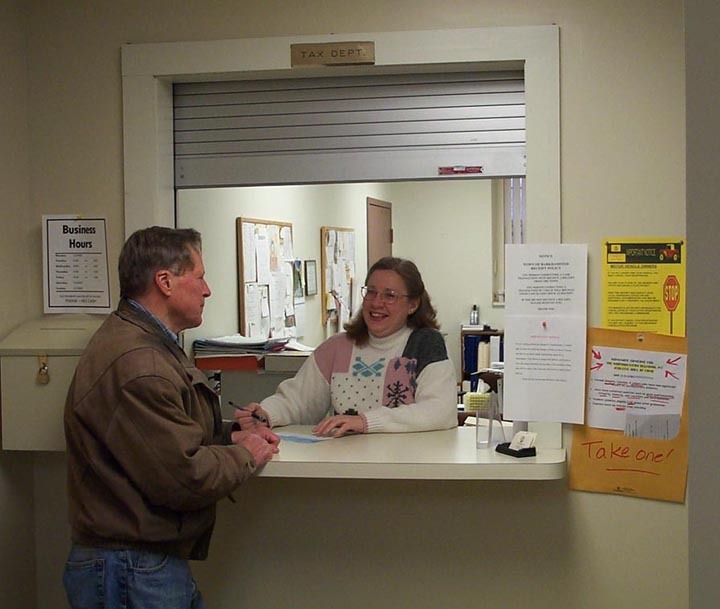 Photo- Barkhamsted Tax Collector Terri Collins helping a resident with a tax issue. Terri has been the town's tax collector since 1987. The position is a part time job- she is paid for 1,200 hours per year (about 23 hours per week) although she may actually work another 100 hours over the course of a year to cover special situations and periods of peak demand. She is helped by the assistant tax collector, Linda Fancher (a former Barkhamsted tax collector), who is paid for 520 hours a year. The tax collector's job is an elective position, and Terri, a Democrat, ran unopposed in the 2001 election. Terri is a life long resident of Barkhamsted and jokes about coming full circle in her life: she attended kindergarten at a classroom located in the basement of the town hall and now works in an office, guess where, in the basement of the same town hall building! Mailing out the tax bills can be a stressful time in the tax collector's office. Barkhamsted contracts out the printing of the tax bills to Quality Data Services, which is the same firm that provides the computerized tax record system utilized by the town. The tax bills are printed and delivered to the town in mid-June. That only leaves about 2 weeks for Terri and Linda to stuff the envelopes and get them out before the July 1 deadline. Six thousand tax bills covering real estate, auto and personal property are put into the envelopes and mailed. Linda does much of the stuffing at her home while Terri covers the office. In order to save postage, bills going to the same address are combined together in the same envelope when appropriate. Knowing when this is appropriate takes some experience. Normally the whole process goes smoothly, but one glitch this year involved a problem at the printer. The 2001 tax bills that arrived in June were supposed to refer to the valuations on the grand list "as of October 2000". When the bills arrived, they instead read "as of October 1900"! The printer had to make another set, which came in with the correct year. Once the bills are mailed out, the busy period continues as taxpayers call or stop by with questions or to pay their bill. The fire tax, auto tax and first installment of the real estate tax and personal property tax are due August 1 (if your real estate tax or personal property tax is under $100, the entire amount is due August 1). As taxpayers pay their bills, Terri and Linda record the payments on the computer. The tax for an individual taxpayer is calculated based on the assessed value for property and the town mill rate. In the calculation, the town will tax you on 70% of assessed value. The tax rate or mill rate (a mill is 1/10 of a cent) set by the town for 2001 is 27.5. So, as an example, a 1.5 acre lot with a three bedroom house, two car attached garage and an outbuilding in Barkhamsted is assessed for $170,300 on the grand list. The 2001 town property tax would be 70% x $170,300 x .0275 = $3,278.28. The bad news is the Barkhamsted Fire District also wants a piece of your hide. Their mill rate of 1.4 is also applied, adding another $166.89 to the tax bill example here. The good news is that you only need to pay half of the town property tax bill by August 1 if the total exceeds $100. The second payment can be paid six months later, by February 1. Your property tax for vehicles and personal property is calculated using the same formula, but the entire amount for these and the fire district tax are due by August 1 (personal property totals over $100 can be made in two payments). In 2001, the four largest taxpayers in the town of Barkhamsted were the Metropolitan District Commission, owners of the Barkhamsted Reservoir and thousands of acres of watershed land ($525,953), Connecticut Light and Power ($90,023), Mallory Brook Plaza ($89,012) and Sterling Engineering ($85,821). These amounts cover real estate and personal property for both the town tax and fire district tax. As cited in the example above, a typical taxpayer with a 1.5 acre lot, three bedroom house, two car garage and outbuilding would pay about $3,500 plus any car tax. Barkhamsted is one of the few towns that combine the fire district tax with the town tax. This makes life easier for the taxpayer because you have one fewer tax bill to lose. But it does make more work for Terri because she is responsible for recording your fire district tax payment. Previously the fire district did this record keeping. When August 1 comes and goes, the first wave of tax payments is pretty much complete. But even at this point Terri cannot take it easy. This is the time she really goes to work because this is when she deals with delinquent taxes. One of the most important jobs of the tax collector is to bring in as much as possible of the tax due to the town. Coming in with a good collection rate is critical if the town is going to meet its budget. Some taxes cannot be collected. Currently the collection rate is 98.5% which is the best (highest) it has been since Terri started in 1987. Even one tenth of a percent in the collection rate is significant, being worth almost $6,000 in tax revenue for the town. Collecting some of the delinquent taxes is easy. In many cases, people have just forgotten the due date and a simple reminder from Terri clears up the problem. Paying your taxes late does trigger an interest fee of 1.5% per month (18% annual rate). Of course late taxpayers are not big fans of the interest charge which can lead to stressful situations in the Tax Collectors office. For example this season (winter 2002) when the second payment was due, some taxpayers waited until the last day to pay, but a few found themselves iced in due to some bad weather. They were unable to get out on February 1, the last day to avoid interest charges. They had a good excuse, but appeals to the Tax Collector are fruitless because Terri does not have the authority to forgo interest charges on late tax payments. Only the selectmen can do this using a formal process that has to be announced in public at a town meeting. This process has not been invoked recently. Of course a person's interest charge on a late tax payment is more money in the bank as far as the town is concerned. Recently one of the town's largest taxpayers was a couple of weeks late resulting in an interest charge of many thousands of dollars. One tool used to collect delinquent car taxes is to work with the State Department of Motor Vehicles. The town sends information on delinquent car taxes to the DMV, which will flag that person and not allow car registration renewals until the tax is paid. Also, some accounts for car and personal property tax are turned over to collection agencies. If taxes on real estate go unpaid, the town has the right to sell the property to recover the taxes. "Tax sales" such as this are relatively rare, although Terri is currently working on a couple of situations that may lead to tax sales. These are something the town tries to avoid because of the time, costs (notifications, etc.) and the anxiety caused to all parties involved. Terri enjoys the Tax Collector's job. She likes to work with numbers and enjoys the personal contact with residents. She is a certified Connecticut municipal tax collector, having completed a series of courses run by the University of Connecticut and the State Tax Collectors Association. In addition, every year she attends a three day seminar that helps collectors stay current. The seminars cover issues such as new ways to keep up the collection rate and how to apply tax collection rules consistently. The state encourages the uniform application of property tax rules across all towns. Photo- Barkhamsted Town Hall. The tax collector's office is located on the basement floor. Terri has seen changes in the tax collection process over the 15 years she has occupied the position. The biggest change has been the conversion to a computer based system. When she first started in 1987, the process was done manually which involved posting taxpayer entries in big rate books. Interest charges and balancing were also done manually. Computers were introduced in 1990 and the system has been improved over time and is light years more efficient than the manual process. Managing delinquent bills is easier and collection rates have gone up. Another change is the number of hours that the tax collector's office is open to the public. The hours of service have expanded over the years from about 12 hours per week up to the current 20 hours (the Tax Collectors hours are currently 9:00 to 3:00 on Tuesday and Wednesday and 9:00 to 1:00 on Thursday and Friday). Another change Terri witnessed was the moving and expansion of the town hall building. The town hall moved down the hill in June of 1988 and was renovated. The cramped Tax Collector's office on the main floor of the old building was moved to the basement at the new location and expanded, providing a little more space for this critical town government function.